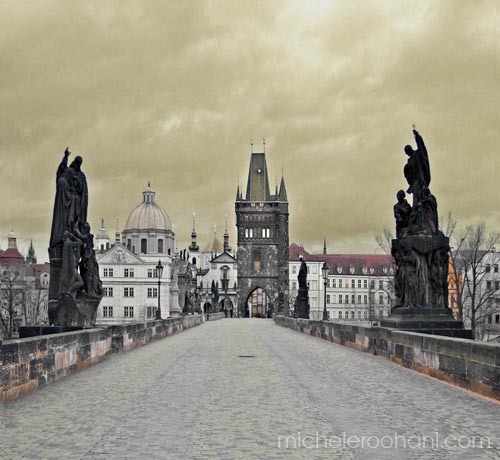 This entry was posted in architecture, culture, photography, quotes, travel and tagged babooshka dools, charles bridge, Dvořák, kafka, Mucha, Prague, Praha by Michele. Bookmark the permalink. Sometime I wish some magician makes me a little mouse, getting up in your bag and traveling the world. I looked at the photos. For sure small pictures don’t do justice.. BUT.. they make one dream. Everything is food for the heart, for the eyes, for the culture. You did so well again. 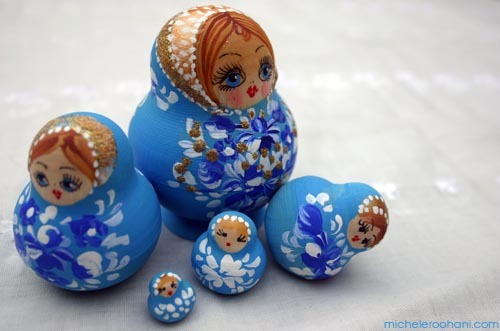 As I like so much Dvorak, I need to come back to kafka … I love the blue babooshka dolls (blue is my fav. colour). Thanks Michele. I was in Prague last year in May and again this year in May. The stark difference was that the first trip was a romantic one, an anniversary trip with my wife, and the other a close friend’s bachelor party! 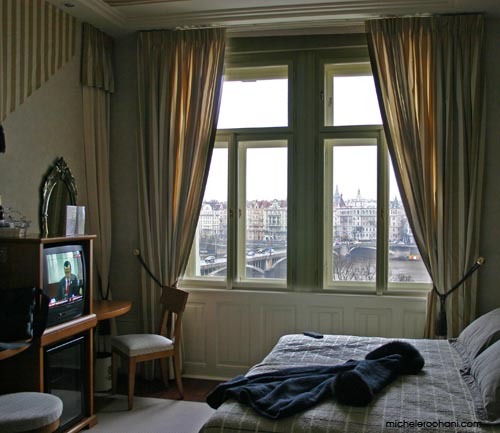 As it turns out, Prague is also known for its multifunctionality, designated as the capital of what’s soft and harsh about the human nature. If there was ever two different sides of a city I’m here to report that Prague is both Dr. Jekyll and Mr. Hide! It is simply amazing! Hands down, it’s the most beautiful city in Europe. It’s vivacious and humble, yet it acts a wormhole to a past that’s peppered with Baroque style architecture, Gothic steepled churches, and friendly people. Oh, and the Goulash is fantastic! 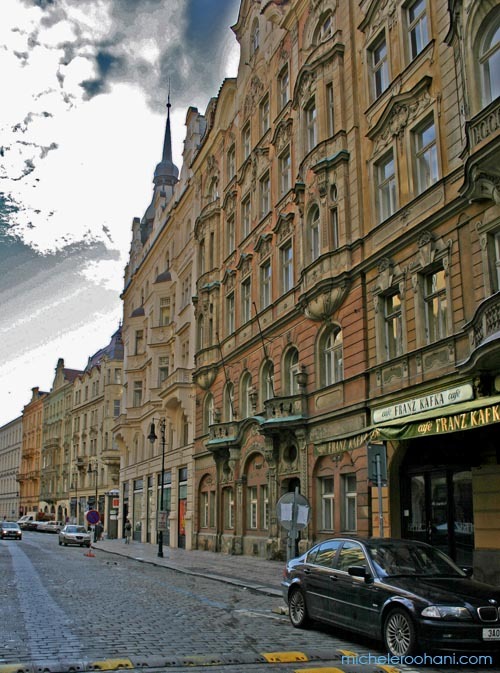 Given all that culture, Prague also serves as the entertainment capital of Europe. Bus loads of tourists visit the city for its churches and museums during the day, while a similar, but much louder group come out at night to see its other side. The night clubs, bars, discos, cabarets, and the casinos can sure give the city an around the clock appearance. So, although on the one hand, you have the sheepish day tourists, gathering in large numbers in front of the Astronomical Clock inside the Grand plaza, waiting for the top of the hour and the inevitable ringing of the bells – which reminds me of the time I watched paint dry for an hour – you have on the other hand the drunk British Stag party crowd, crawling out after the sunset, hitting bars, casinos, clubs, and cabarets and topping the night with a morning meal at Dawn and before returning into their dark dwellings. I do agree that the second set of tourists are a lot more obnoxious and probably not good for the city. But that’s what’s funny about economy, it works when it works! This is a testament to Prague’s versatility that it concurrently serves both ends of the human spectrum successfully. My two trips were also a great personal lesson in the differences between men and women; but getting into it would make a long log. 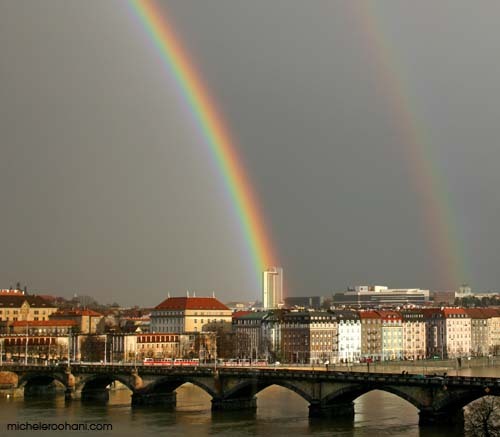 So, thanks for the post Michele, it was a great reminder of the two cities that dwell in the same human mind. I would express something today to Ali. 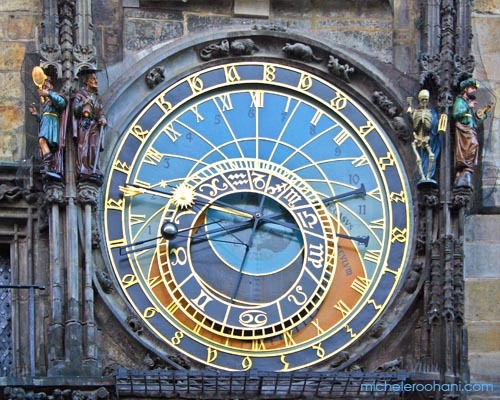 Thank you for this extraordinary writing on Prague. 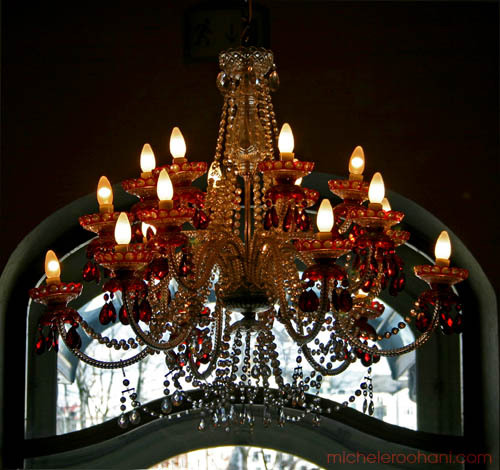 I always read your posts on michele’s blog, and like them, as they are very interesting. today…. i was/am really impressed. Thank you so much.. She did the photos, she submitted the subject, and you … did the rest. Beautiful… You know what ?? I’d like to take the first plane now… and fly to Praha. Now, In my previous post, I didn’t mention anything about Michelle’s great selection of Babooshkas! After all, it was the tittle of the post! Aren’t these little marvels captivating? What beautiful, colorful, and mysterious objects they are. Like little onions, they unravel to their core with a surprise in each layer. But unlike onions, no tears! In a strange way, they truly represent us, don’t they? Consider this. Every year that we get older don’t we simply grow a layer over our previous self? So when we’re 37, aren’t we also 36, 35,…19,18,…7,6,5,…? If this is right, amazingly, our core is still the toddler full of wonder, one who grabs a stranger’s nose if he/she got too close to our face, or the 4 year old with his/her endless why questions, eager to learn. It appears, however, that as these outer layers are laid down, we grow farther and farther out of touch with our inner layers. Our core grows away as we live on the daily grind of our surface. It’s sad. For many of us, we’ve lost touch completely and for others, only in special occasions we may visit it. But I do wish there was a way we could also open our own shells on regular basis, and dust off our inner shells. Maybe we could find a lot about why our outer shells are shaped the way they are. Have fun in Prague Marie and buy yourself a Babooshka for a souvenir! 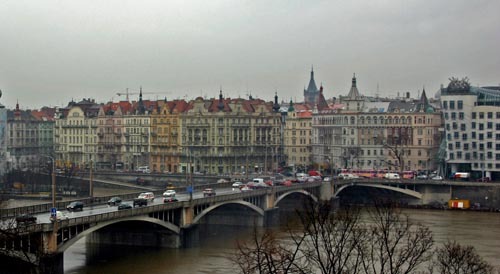 Prague est sans conteste une des villes les plus représentatives de ce qu’a été la “Mitteleuropa” avec Vienne et Budapest, et qui a été une des grandes périodes de la vie intellectuelle de l’Europe . Il me semble que dans le livre de l’écrivain français Danièle Sallenave :”Passages de l’Est” , il y a des phrases intelligentes sur cette ville. Il est aussi possible de lire “La pleurante des rues de prague” de Sylvie Germain. 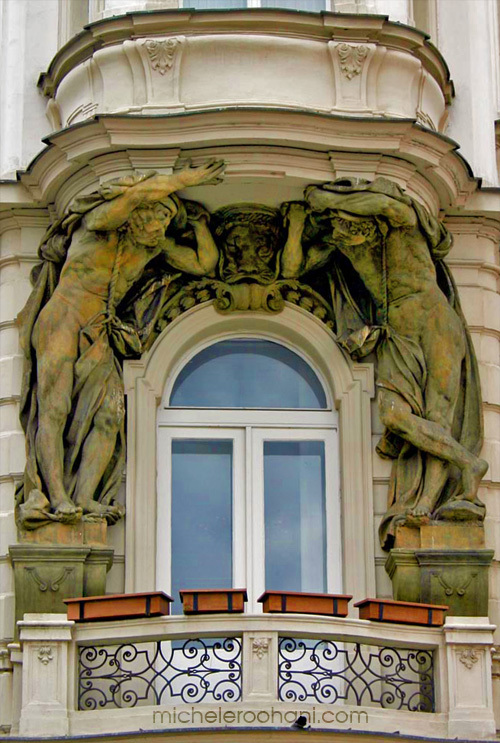 Prague a aussi été un des foyers de la Kabbale en Europe : pensez au mythe du Golem. Thanks for sharing those beautiful and unforgattable moments of your life. Those pictures are really BREATHTAKING, beautiful and with a touch of an artist of course!. By looking at them it feels like traveling with you.Why don’t you contact a tourist company? They will buy them for sure. 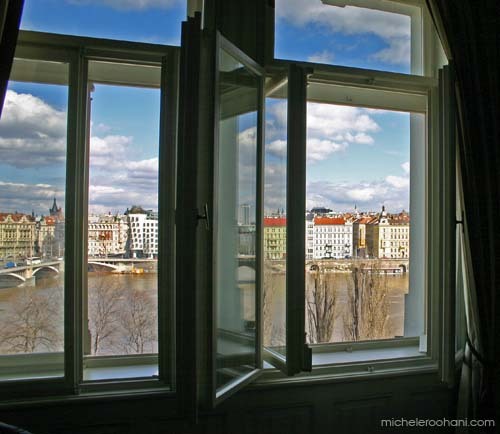 Seeing Prague through the eyes of an artist is a privilege. Now I’m almost afraid of going there because seeing it with my own eyes might be to great a disappointment. 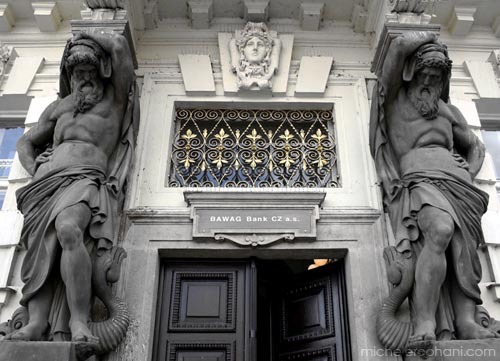 By the way, I don’t think you have a single picture of Caryatids. 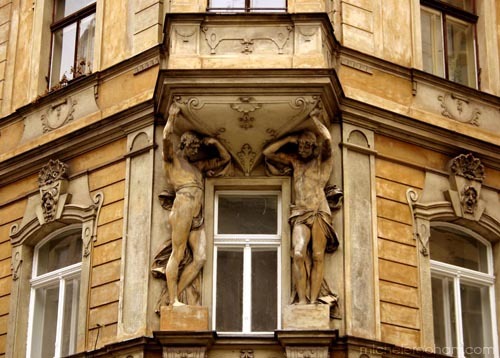 All those strong men holding up buildings are called Atalantes (from Atlas). Fascinating, really, this is the eye of an artist. The best book on Prague is still that of Peter Demetz. 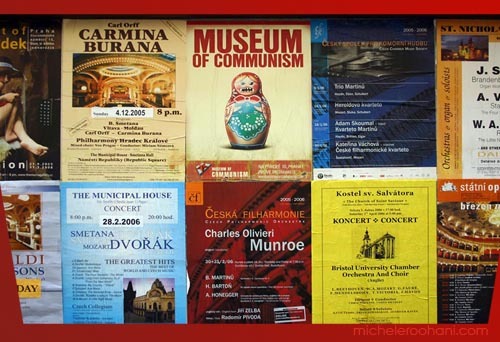 Talking about Prague do not forget Kundera. 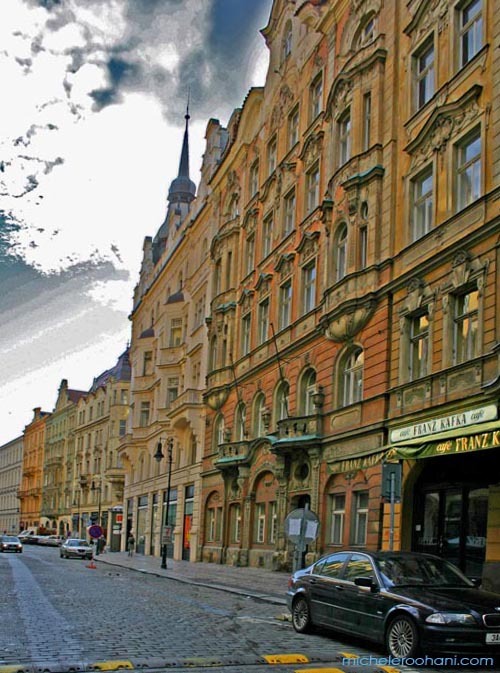 Prague Known as the “golden city of spires,” has architectural splendors that span a hundreds of years. the Medieval, Baroque, and Renaissance. 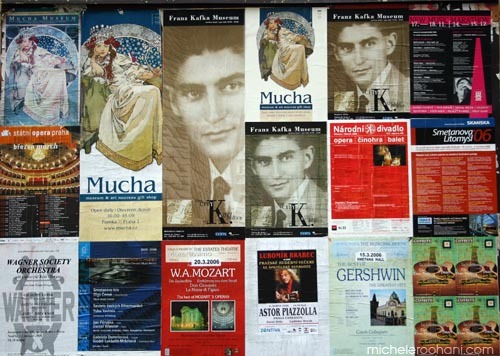 The architecture of the city is reflected in the writings of the surrealist, Franz Kafka The city’s convoluted streets and unpredictable architecture are reflected in his bizarre, disturbing stories. Thank you for the suggestion to visit this gem-city. Your pictures give a great impression of the beauties which are a must to see at least ONCE in a lifetime. My daughter was in Prague recently so I’ll also show them to her. 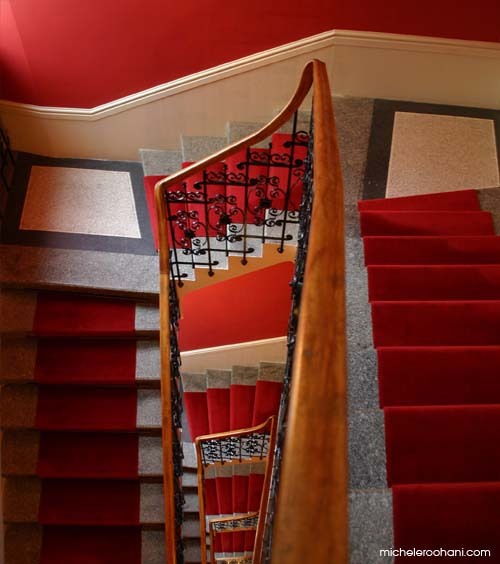 The images of the red staircase and your lucky double rainbow are truly enthralling.